You may feel almost helpless at times, trying to resist the ubiquitous temptation to indulge in greasy food. Whether your favorite guilty pleasure is French fries, cheeseburgers, pizza, fried chicken, bacon, potato chips or nachos, you probably know these are not healthy food choices. The high concentration of bad fats in these foods can undermine your health in a variety of ways. Being mindful of the potential adverse effects of greasy food on your body may help you make dietary choices that support rather than sabotage your good health. Greasy foods are calorie-dense, which means they contain a large number of calories in a small volume of food. The cycle of hunger and fullness, or satiety, involves several hormonal, psychological and mechanical signals. An increasing volume of food in your stomach is an important signal that reduces hunger and prompts you to stop eating. When you eat greasy foods, you often consume more calories than you realize because they are concentrated in a relatively small volume of food. For example, a cup of French fries and a cup of apple slices produce the same feeling of fullness in your stomach. The French fries, however, contain three times more calories than the apple slices. Excess calorie consumption associated with greasy foods may cause you to become overweight or obese. Excess body weight increases your risk for many medical conditions, including high blood pressure, stroke, diabetes, heart disease, certain types of cancer, fatty liver, gallstones, degenerative arthritis, sleep apnea, asthma, and menstrual or fertility problems in women. 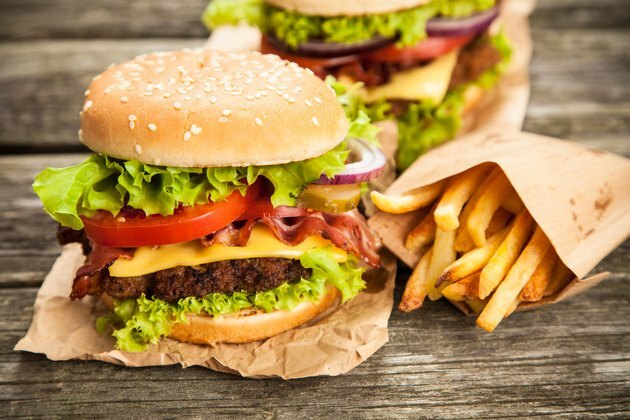 Greasy foods typically contain high levels of one or more dietary fats that contribute to elevated blood levels of total cholesterol and LDL, or "bad," cholesterol. If you consume too much saturated fat, trans fat and/or cholesterol, you are at increased risk of developing atherosclerosis. With this condition, fat deposits obstruct blood flow through your arteries, which may lead to a heart attack, stroke or peripheral arterial disease. The National Institutes of Health reports that atherosclerotic heart disease is the leading cause of death among Americans. If you're filling up on greasy foods, you may not be eating adequate amounts of healthful foods, such as fruits, vegetables and whole grains. Not eating adequate amounts of healthful food because you're eating too much greasy food can be a double-whammy. Not only are you potentially doing harm by eating unhealthful foods, you may also be depriving your body of nutrients needed to keep your organs and tissues functioning normally. Depending on how much greasy food you eat, you may develop vitamin or mineral deficiencies because of your diet. Following a healthful diet does not mean you need to eliminate fat from your nutrition plan. When it comes to dietary fat, the keys to a healthful diet are eating the right types of fat and limiting your total daily intake. To reduce the amount of cholesterol and saturated fat in your diet, eat nonfat dairy products instead of whole-milk products; choose lean cuts of meat and trim excess fat before cooking; remove the skin from poultry before cooking; broil or roast meat, fish and poultry instead of frying; and increase your intake of beans and fish as protein sources instead of red meat. Including nuts, sunflower seeds, avocados and olive oil in your nutrition plan provides you with healthful unsaturated fats, which may help lower your blood cholesterol level and reduce your risk of atherosclerotic heart disease.